Oysters sit in a basket in Harspwell Maine in this May 2017 file photo. Concerns over a biotoxin bloom in Casco Bay has resulted in a late-season shellfish harvesting ban from Cape Elizabeth to Harpswell. A bloom of a type of a cold-resistant biotoxin has resulted in a temporary ban on harvesting some shellfish species in Casco Bay. 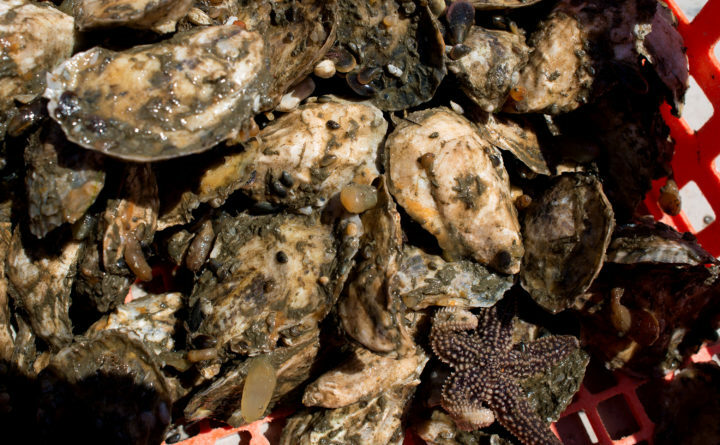 Maine Department of Marine Resources implemented the closure earlier this week, warning that consumption of bivalves and other types of marine organisms contaminated with naturally occurring domoic acid could result in amnesic shellfish poisoning, also known as ASP. The closure, first enacted on Tuesday, stretches from Dyer Point in Cape Elizabeth to Basin Point in Harpswell and extends seaward to the edge of state jurisdiction, roughly three miles from shore. On Friday, it was expanded to include a portion of the New Meadows River between approximately Howard Point in Brunswick and Laurel Point in Harpswell. Certain strains of phytoplankton known as Pseudo-nitzschia are known to produce domoic acid, which if consumed can cause gastrointestinal symptoms at first and then headaches, confusion, dizziness, disorientation or even long-term memory loss, according to state officials. In severe cases, seizures, weakness and paralysis or death may occur. Increased levels of the biotoxin have been occurring more frequently in Maine over the past few years, prompting state officials to boost their monitoring efforts to try to better protect public health. In 2014, it began partnering with Bigelow Laboratory for Ocean Sciences in East Boothbay to test shellfish samples from areas where biotoxins were detected, and last year the state obtained its own equipment to do the same. The current ban in Casco Bay mostly affects clam diggers, which for the area are estimated to number in the dozens who actively harvest this time of year, but also applies to mussels, oysters, and carnivorous snails. The ban does not apply to scallops, the annual harvest of which in state waters began last week, or to lobster, crabs, shrimp and finfish, which are not generally considered at risk for domoic acid contamination. The closure in Casco Bay is unusual for this time of year, when water temperatures along the coast usually are cold enough to prevent harmful algal blooms. Another type of harmful algal bloom called “red tide,” which is caused by the Alexandrium phytoplankton, has a much longer history in Maine and, when it occurs, usually does so between April and October, according to DMR. Toxins produced by Alexandrium, when consumed, can result in paralytic shellfish poisoning. Blooms of Pseudo-nitzschia appear to be less dependent on warm water than outbreaks of Alexandrium. Pseudo-nitzschia is not new to Maine, but that harmful blooms of the phytoplankton are, said Kohl Kanwit, director of DMR’s Bureau of Public Health. The department is unaccustomed to having to enact biotoxin-related closures this time of year but recognizes there is a need to be vigilant. The first time Maine ever closed a shellfish harvest area because of elevated levels of domoic acid was a little over a year ago, in October 2016. The state recalled some shellfish in association with the 2016 closure and did so again three months ago, when it enacted a closure east of Mount Desert Island because of the biotoxin. DMR spokesman Jeff Nichols said Friday that the department has enacted the closure in Casco Bay as a precaution. Toxin levels measured at 17 part-per-million on Tuesday, below the 20-part-per-million threshold that would require a mandatory closure, but domoic acid levels can increase quickly, he said. The testing equipment at Bigelow Lab and at DMR’s offices in Boothbay Harbor now allows the state to get faster results — it used to have to send samples to the federal Food & Drug Administration — which can help minimize the amount of shellfish affected by recalls that stem from precautionary closures, Kanwit said. Upper Blue Hill Bay also is closed to harvesting clams, mussels, oysters and carnivorous snails out of concerns over possible amnesic shellfish poisoning. Lower portions of the bay also had been closed but were reopened on Friday. There are other shellfish harvesting closures in effect elsewhere in the state, for other reasons. There is a temporary ban between Prout’s Neck and Scarborough on harvesting surf clams, which take longer to rid themselves of toxins than other bivalves, due to concerns about paralytic shellfish poisoning. There also is a long standing statewide ban on harvesting certain carnivorous snails that produce natural biotoxins. Concerns about pollution that stem from heavy rainfall overnight on Tuesday have resulted in temporary closures in the Medomak River and in Machias Bay.